When you stay at Alcala Plaza in Alcala de Henares, you'll be within a 10-minute drive of Capilla de las Santas Formas and Palacio Laredo. 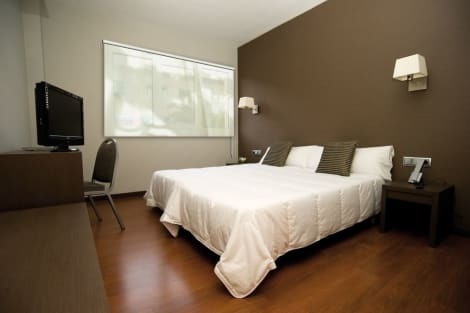 This hotel is 2.3 mi (3.7 km) from Torre de Santa Maria and 2.3 mi (3.7 km) from Colegio de San Ildefonso. When you a stay at Miguel de Cervantes in Alcala de Henares, you'll be in the historical district, just steps from Cervantes Birthplace Museum and Hospital de Antezana. This hostal is 15.5 mi (24.9 km) from IFEMA and 14.9 mi (23.9 km) from Plenilunio Shopping Mall. Featured amenities include complimentary wired Internet access, a business center, and complimentary newspapers in the lobby. Planning an event in Alcala de Henares? This hotel has facilities measuring 9469 square feet (880 square meters), including conference space. Self parking (subject to charges) is available onsite. Grab a bite at Hosteria del Estudiante, one of the hotel's 2 restaurants, or stay in and take advantage of the room service (during limited hours). Snacks are also available at the coffee shop/café. Relax with your favorite drink at the bar/lounge or the poolside bar. Breakfast is available daily for a fee. This hotel is located in Alcala de Henares, lying next to Martyrs Gate. The hotel is nestled amidst the rich cultural, historical and artistic heritage of this mesmerising World Heritage Site. Guests will find themselves surrounded by ample opportunities for exploration and discovery. This wonderful hotel is located within easy walking distance of Cisneriana University and the train station. The hotel enjoys a charming architectural design, complementing its surroundings with elegance and grace. The guest rooms are tastefully designed, offering comfort and style. Guests will be pleased by the many facilities and services that this charming hotel has to offer. The Hostel has 34 rooms Val. Distributed as follows: 17 double rooms with two beds and possibility of triple suplemento.2 individuales.5 10 rooms with single bed 135 with the possibility of supplement. All rooms feature the following services: Heating, Air Conditioning, Private bathroom, TV, Wireless Internet.En accommodation includes a breakfast with toast, muffins, soba, jam, butter, coffee, milk, cola, cocoa, tea, etc. The customer is served as you wish. 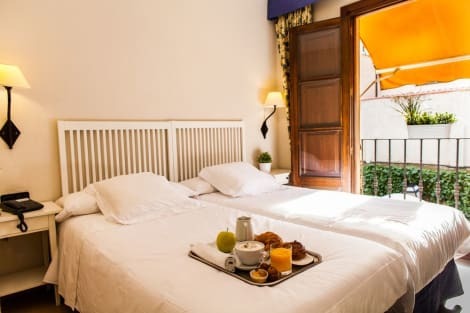 This smart city hotel is set in an attractive townhouse in the middle of Alcalá de Henares, 30 kilometres from Madrid's city centre. Many campus buildings of Alcalá University are within a few minutes' walk, making this a great location for those who wish to visit students. 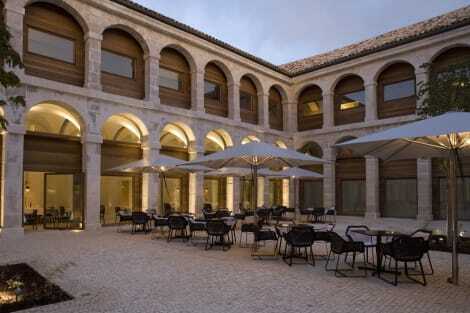 The hotel is also surrounded by the many monuments of this ancient Castillian city. The air-conditioned rooms feature wired internet, a flat-screen TV and a private bathroom. Take in the views from a terrace and make use of amenities such as complimentary wireless Internet access and concierge services. Additional amenities at this hotel include wedding services and a television in a common area. Guests can get around on the shuttle (surcharge), which operates within 50.00 meters. The hotel is located in the new business and commercial area of Alcalá de Henares and 10 minutes from Barajas International Airport. The air-conditioned hotel welcomes guests into a reception hall with 24-hour service. There are 79 fully - equipped rooms and a large convention centre with conference room. Facilities include bar, café and restaurant. WiFi, playground and garage and car park are provided. The rooms come with either 2 twin beds or 1 double bed and are fully - equipped. There are terrace, air-conditioner, room and laundry services. The hotel has 1 indoor swimming pool and 2 outdoor swimming pools with poolside bar and sun loungers and parasols. In the spa area, guests can swim upstream, relax in the solarium and enjoy a Turkish bath. fully - equipped gym with plasma televisions in front of each machine is available. A breakfast buffet is offered every day. 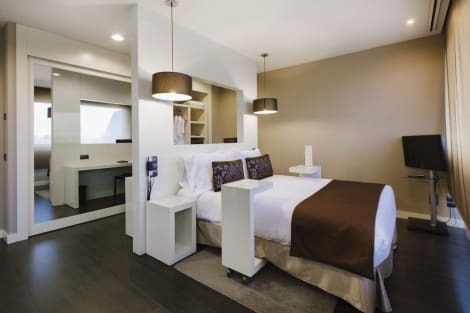 lastminute.com has a fantastic range of hotels in Alcala de Henares, with everything from cheap hotels to luxurious five star accommodation available. We like to live up to our last minute name so remember you can book any one of our excellent Alcala de Henares hotels up until midnight and stay the same night.